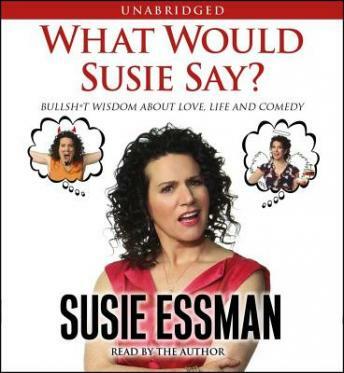 IN WHAT WOULD SUSIE SAY?, Susie Essman sheds the crasser layers to reveal how she went from an anxiety-ridden, struggling stand-up comic to being one of the funniest women on television, playing Susie Greene on HBO's Curb Your Enthusiasm. Emerging as one of the most successful performers in her field, Essman goes behind the scenes of a life in comedy with her funny cohorts, including Joy Behar, Rodney Dangerfield, and, of course, Jeff Garlin and Larry David, while also providing sidesplittingly funny wisdom on a range of topics that she's highly unqualified to expound upon, including men, sports, hypochondria, and stepparenthood. WHAT WOULD SUSIE SAY? is Essman's irreverent, refreshingly candid, and hilarious retort to the dubious facts of life that we all face. Okay, I don't have HBO or where ever I could see 'Curb Your Enthusiasm' so I didn't even know who Susie Essman was before listening to her book. I didn't need to know who she is because this book is fabulous! She is a great teller of the stories of her life, she is funny, smart and she has quite a lot of great advice. One warning though: if you are squeemish about any sexual topics this book is not for you.